We may only be two games into the new regular season in the Euroleague but this game sees two teams with polar opposite records squaring up to each other. The hosts come into this game after two defeats and their 0-2 record goes up against the 2-0 record of the reigning Euroleague champions. It should be straightforward for the champions but that’s not how it always works. This is going to be a tough task for the hosts but you’ll find that this is the sort of game that ignites crowds and inspires players to reach new levels. One player that has been in great form so far for Anadolu is Cedi Osman. Osman has averaged 18 points per game, and if he can hit that form in this game, the Turkish side may be able to push the champions. Osman will want support from players like Derrick Brown, with an average of 13 points per game and DeShaun Thomas, who has provided an average of 10 points per game this season. If these players deliver, we could enjoy a fantastic night on Tuesday in Istanbul. The Russians will be confident in this game. They are the current top scoring team in the league after averaging 95 points in their two games. This is 20 more than the average obtained by Efes. 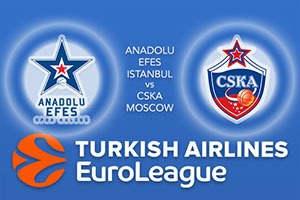 These two sides have met 14 times since 2000 in the Euroleague and the Russians have won 11 of these games, including the last clash two seasons ago. As you’d expect, Nando De Colo leads the way for CSKA Moscow with an average of 21 points per game. Milos Teodosic and Aaron Jackson both have an average of 13 points each for CSKA so far this season and this is a big reason why they are out in front and look capable of winning so many games so comfortably. Understandably, the bookmakers can’t see beyond the Russian side. Take CSKA Moscow at -7, on offer at 1.90. If you’re looking for the Over/Under market for this game, going OVER 169.5 at odds of 1.90 will hopefully be of benefit. Bet Now!